Note: I’ll be posting a remembrance of Mickey Rooney, always a favorite here, within the next few days. Until that time here are obituaries from the Los Angeles Times and New York Times. Mickey Rooney passed away Sunday at the age of 93. 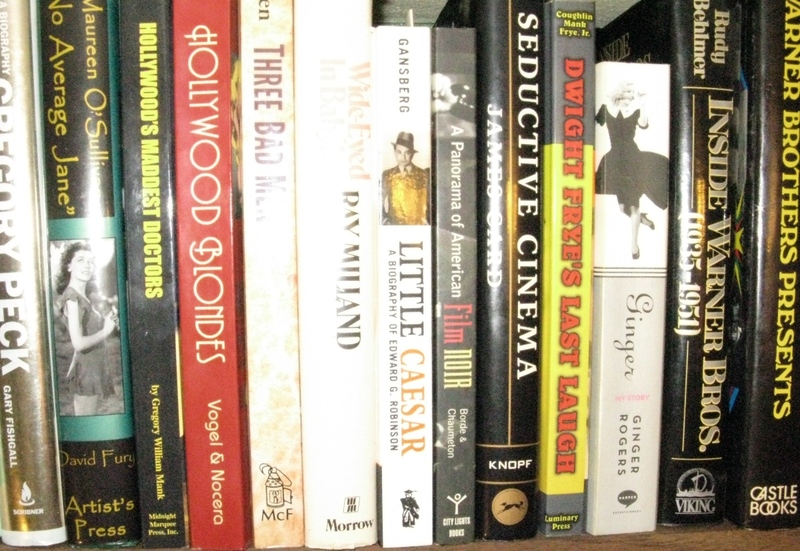 Past Immortal Ephemera articles about Mickey Rooney and his movies can be found HERE. This mid-1930 MGM release has the feel of a slightly later Warner Bros. gold digger movie, minus the musical numbers. Busby Berkeley even comes to mind during its big Oyster Bay fashion show, or at least that's what I thought during an overhead shot of models in a briefly kaleidoscopic fountain frolic. Our Blushing Brides is overlong at 99 minutes, spending much of that time hammering home the same point, a message to young working women at the start of the Depression to take care in selecting their mate because men, well, most of them are just out for one thing. Joan Crawford’s Jerry seems to be the only working class woman who grasps this point. Luckily Jerry has all of the youthful Crawford’s charm because she is otherwise overbearing in spending the first half of the movie warning her roommates, saucy Franky (Dorothy Sebastian) and naive Connie (Anita Page), about the evils that men wish to do to them. 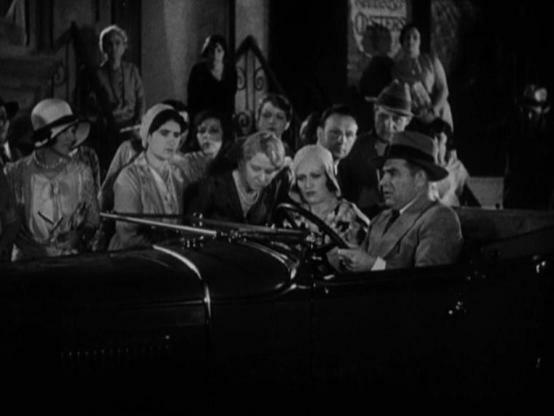 After those fears come true Crawford spends the second half of the movie being empathetic towards her fallen friends while stopping just short of telling them that she told them so. But we know she did and so do they. 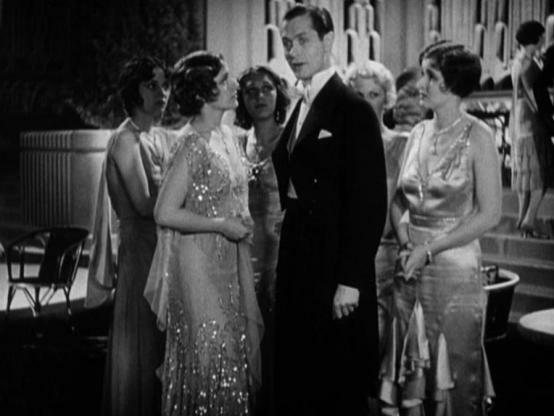 That puts Jerry in a tough position when her crush, Robert Montgomery as Tony, begins returning her interest. Jerry is a floor model at the department store owned by Tony's family and his head is immediately turned while accompanying a very hands-on customer (Hedda Hopper) to a showing of the latest fashions. It is Tony who sets up that Oyster Bay spectacle that I mentioned earlier at his family’s mansion, purely as an excuse to make time with Jerry. It works, but unfortunately for Tony he makes the mistake of coming on too strong after luring Jerry up to the most opulent tree house in recorded history. Above: Robert Montgomery and Crawford (in blonde wig) are up in the trees. Sour on Tony and all out of roommates, as Franky has married Marty (John Miljan) and Connie has become kept woman to Tony’s younger brother, David (Raymond Hackett), Jerry moves into a smaller apartment where she passes the rest of the movie witnessing the fall of her ex-roommates and going on the occasional date with obnoxious co-worker Joe Munsey (Edward Brophy). Our Blushing Brides is the final movie in the loose trilogy begun with Jazz Age sensation Our Dancing Daughters in 1928 and followed by Our Modern Maidens in 1929. 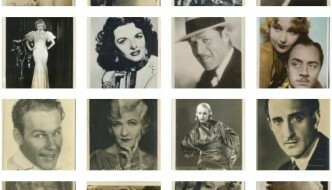 Dorothy Sebastian and director Harry Beaumont are absent from the middle entry, but otherwise key participants, namely Joan Crawford and Anita Page, are present for all three films. Our Blushing Brides was the first talkie of the bunch and it shows as the movie just keeps saying the same thing: Protect your virtue, beware of men. As early talkies go it’s actually well done and stars Crawford, Page and Sebastian are all excellent at handling dialogue. Even the sound itself is crisp and natural, but the problem is much of what is said is trite and repetitive, surprising given the experienced screenwriting pair of Bess Meredyth and John Howard Lawson. 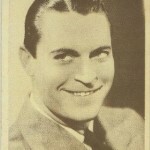 Director Beaumont would work on better Crawford films the following year in Dance, Fools, Dance and Laughing Sinners, though neither of those are considered essential Crawford either. 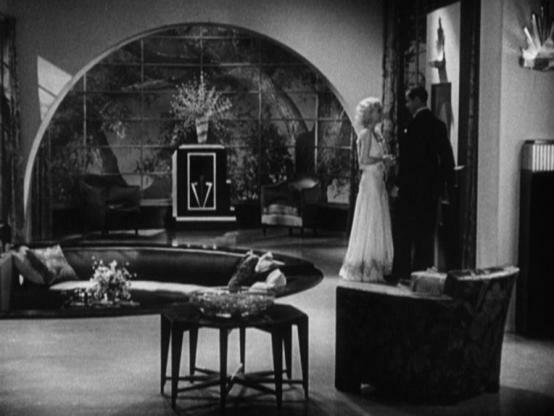 Our Blushing Brides has its strong points, most of them visual thanks to the array of gowns by Adrian and art deco sets courtesy Cedric Gibbons, but it is overwhelmingly an empty beauty because of a story that leaves us twiddling our thumbs while awaiting the inevitable. This is a movie only a Joan Crawford fan could love. Of course, there are plenty of Crawford fans and so Our Blushing Brides will always have a built-in audience. 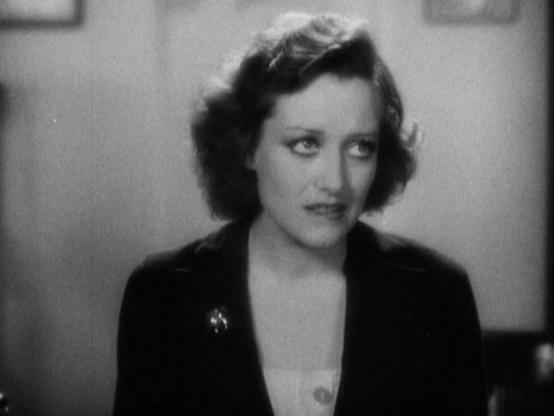 My favorite quote from the period reviews came from an unsigned New York Times piece, which offered praise alongside this slightly backhanded swat: “Miss Crawford admirably survives all her agonized facial contortions.” Her Jerry is agonized throughout, attracted to Tony against her better judgment and wary of the relationships her best friends have become involved in. 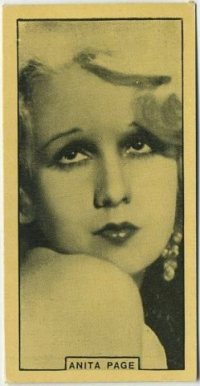 Formerly reckless Jazz baby Crawford is the moral center of Our Blushing Brides and she earned a good amount of critical praise for her performance at the time of the movie's original release. Trade press coverage, discovered courtesy of Lantern's database of periodicals, indicates that Our Blushing Brides did holdover business in New York, Chicago and Los Angeles, as well as many points in between. I'd imagine the strong business was mostly due to Crawford's presence and the connection to the two earlier movies. Dorothy Sebastian and John Miljan are a blast, especially during a shared drunken scene that horrifies Crawford's Jerry, but we don’t get enough of this pair. Like everyone else in Our Blushing Brides they're shoved aside in favor of more Joan. 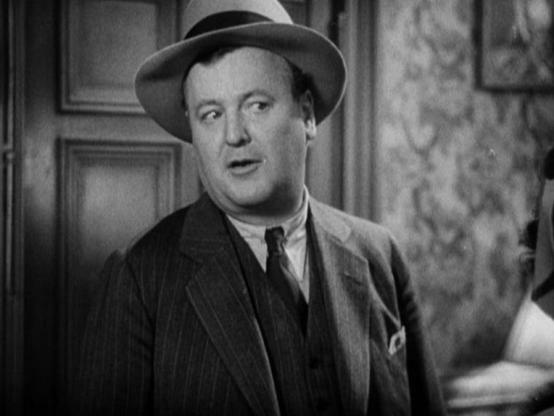 Anita Page is cute but too pathetic while her love interest Raymond Hackett is one of the more invisible cads I've yet to run across. Hedda Hopper stands out in her early scene and Edward Brophy seems to set his schtick for the next couple of decades in his part of overlooked everyman Joe Munsey. There’s a lot of charm between the three lead actresses early in the movie, just not much happening beyond their banter. The melodrama kicks in after the fashion show when Franky and Connie’s misfortunes reveal themselves, but like much of Our Blushing Brides, sound ideas are heaped upon themselves to the point of frustration. There are a couple of shocking moments to pique the interest, but I found myself chuckling in the wrong spots after each of those revelations played out further then they needed to be taken. While I obviously found this one a bit tedious, you'll find more positive views of Our Blushing Brides written by my friends at Shadows and Satin and Laura's Miscellaneous Musings. Thank you to Warner Archive for providing me with a review copy of Our Blushing Brides, which was recently released as a Made to Order DVD-R that you can order HERE. Both Our Dancing Daughters and Our Modern Maidens have previously been released to the Warner Archive Collection. Above: Robert Emmett O'Connor, about to brandish his ever present badge. 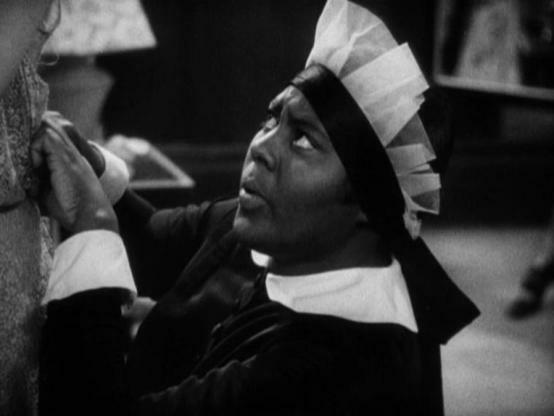 Above: Louise Beavers doing what Louise Beavers so often does. Above: Claire Dodd is the first of the Mannequins to pass us by. Boy you said it, Karen, if it isn’t one thing, it’s another …. Thanks so much. You know, I didn’t think it was terrible and tried to point out some of what I liked, but it really dragged for me in spots and Joan was a bit of a bummer, despite an excellent performance. I think I just wanted her to break out in a Charleston for old times’ sake! I’m less forgiving to Montgomery, but I’m more of fan of his work beginning in the mid-30s when he seems a bit more fully formed. Hi Cliff! I missed a lot of reading during the TCM Festival days in early April and have been going back and trying to catch up. 🙂 Thanks so much for linking to my review! I enjoyed reading your perspective on the movie. Have also enjoyed some of your other reviews today, including IT HAPPENED IN HOLLYWOOD. 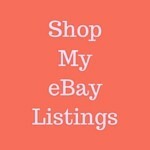 I just picked up the Fuller set for a fantastic price and look forward to checking it out. Wow, I had no idea It Happened in Hollywood had a DVD release (or if I did, I forgot!). I’ll have to take a look at what else is in that set. PS, Laura, I know you’re just getting caught up, but did want to point out one of my more recent posts covers four titles starring Jessie Matthews–I know your Dad is a fan, so I wanted to make sure you didn’t miss that one! Thanks so much Cliff, I saw your Matthews post last night and sent it to my dad right away. Heard back from him today how much he enjoyed it and he’s glad to see someone spreading the word on her! !